Cheltenham has undergone a broadband revolution in the last few years. By 2015 at least 88% of the town able to upgrade to superfast fibre-optic broadband with speeds of 35 Megabits per second (Mbps) or faster. But it also become clear at the same time that thousands of homes in Cheltenham were going to be left out of this revolution. Gaps were being left between the commercial operators like BT and Virgin and the government-subsidised ‘Fastershire’ programme being run by the county council. This was particularly serious as Cheltenham had historically poor broadband speeds, some as slow as 0.5 Mbps. 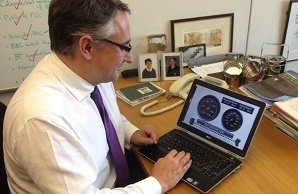 Martin lobbied ministers, operators and the county council to get broadband moving for everyone. The origins of the problem in Cheltenham dated back to the 1920s when Cheltenham got a central telephone exchange. As the town grew, the distance from that exchange initially just meant slightly worse voice call quality. Today, internet broadband speeds drop off sharply the further you are from the exchange. In outlying areas such as Up Hatherley and Springbank speeds can be as low as 0.5 Megabits per second (Mbps). The coalition government put more than £100 million for England into a subsidised programme to reach those areas that were not commercially viable. But by 2015 BT had only reached 88%, new estates and developments across Cheltenham were being left out and the the county council’s ‘Fastershire’ programme wasn’t filling the gaps. The coalition government’s targets were for 90% availability of superfast broadband, with speeds as high as 25, 30 or more megabits per second, and for everyone to have the basic 2 Mbps broadband service – although the new Conservative government has quietly dropped some of these targets. Certainly that last target was missed in Cheltenham under the Conservatives, and if they are not met in an urban area such as Cheltenham, they are unlikely to be met nationwide. When he was the MP, Martin lobbied BT, Virgin, ‘Fastershire’ and government ministers, up to an including the Prime Minister on this issue. 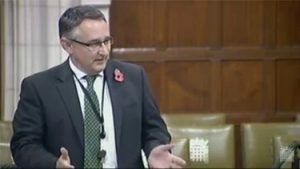 You can read Martin’s parliamentary speech on the issue here and watch it here.